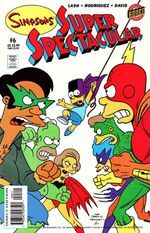 Simpsons Super Spectacular was a comic book series centered on superhero characters (such as Radioactive Man and Bartman) in The Simpsons. The comic was first published in the United States in 2005 by Bongo Comics. A new issue has since been published twice each year until 2012. Simpsons Super Spectacular 1 Holy Cow!! Has Pie Man Turned Evil? The Crimespree on Springfield 2! 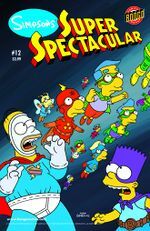 Simpsons Super Spectacular 2 The League of Extraordinary Barts! The Crimes of the Crazy Cat Lady! Simpsons Super Spectacular 4 Shadow Apocalypse of the Sciencester! Simpsons Super Spectacular 5 Captain Cupcake and Pieboy! Señor Ding-Dong, Master of the Doorbell in: For Whom the Doorbell Tolls! Simpsons Super Spectacular 11 The Piemen of the World! 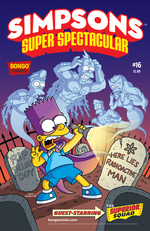 Simpsons Super Spectacular 16 Bartmanga! featuring Robartman! Modified on March 2, 2018, at 17:42.